Now we all need names for the plants and we all need to know what plant is meant by that name. Common names can vary so much not only from county to county but also country to country so it was very important to have a name form that everyone commonly understand. I can remember as a young trainee being told that Latin was the only name to learn and I have kept that up up today, nearly some 30 odd years ago. The use of Latin names as we know it, was set up by the great botanist Carl Linnaeus, who is know as the Father of taxonomy. In 1735, he published the first addition of his famous works, Systema Naturae, which laid out his system of categorising plants into various family’s and groups. These where all named by their reproduction systems, Both in numbers and arrangements. This system has been used ever since. In 1867 the International Code of Botanical Nomenclature (ICBN) was first set up to carry on writing the guide lines for nomenclature and carried on this work until 2011 when it went under a big change and became International Code of Nomenclature for algae, fungi, and plants (ICN). The guidelines are used by botanists to write papers on why a particular plant should be changed, reasons including older names from which with Plant as first named but never caught one. International Association for Plant Taxonomy is the group that agrees the Plant name changes, these changes are written by botanists and have to have all the information and supporting documents explaining why the plants should change and now with the use of DNA, it can be proved beyond any reasonable doubt that the plant should be in its own family or indeed moved to another family. And it this DNA technology that is the reason we have so many plant changes happening over the past few years and I am afraid to say will be happening a lot more in the future. But I suppose my biggest problem with it, is my internal one, we advise people to learn the Latin names as that’s the name that everyone knows it as worldwide, common names differ in different areas of the uk let alone around the world. It also the most stable name for the plant, one that explains how it grows, who discovered it etc. But by changing in as big away as is currently happening, aren’t we just adding more confusion into the world of gardening? Plant names are hard enough to remember without changing. Seeing bits and pieces on social media and talking to people as well, it seems to me there’s a 3rd level of plant names occurring, botanical latin is the first, common names the second and the new one gardeners Latin. Gardeners Latin is the form when the old name is used instead of the new one. Whether you agree or disagree, that to me seems to be happening, maybe until it’s all sorted out a little more and the names become more we’ll known, that’s what is going to have to be done and let’s be honest, changing a name from a simple one to a more complex name is going to take a long time to catch on, we need to give it time and for everyone one supplying and growing the plant in the public domain to be on board, let’s be honest, that sadly won’t happen but let hope! Whatever the name or indeed how difficult it is to say or learn, don’t forget it is still an amazing form of life on our planet and the beauty is there no matter what tag with give it or call it. And names are just tags, given to plants so we can identify them, if you want to enjoy their beauty just as nature intended without boxing it in, well there’s no harm in that what so ever. Wow, I understand the logic in renaming, but there is something to be said for categorizing based on visible structure. How many of us can see the logic of the classification based upon DNA? It really takes some of the fun out of observation, something we teach kids is an important part of the scientific method. As an amateur gardener it’s terribly confusing! You are right when you say this would affect sales. I often go to plant sales with a list but if my lists wrong…. how stupid. Yes, well! With all these new names it’s pot luck as to whether anyone will find the plant they’re looking for. Just after Stipa tenuissima was renamed Nasella (or is it Nassella or Nassela?) I was trying to buy six. Nursery after nursery listed Stipa as out of stock (I later found that all listed plenty of stock under the new name, which I hadn’t then heard of). So they lost business and I bought from the first nursery I came across that was behind the times. Believe it or not, that nursery was Crocus (who STILL only list Stipa)! Nurseries just don’t have the resources to multi list things all over the place and cross-referencing possible mis-spellings. Plus the new names are usually longer and don’t roll off the tongue even if you think you know the right spelling. I’ve seen more instances of “Lampocarpos” than “Lamprocapnos”. 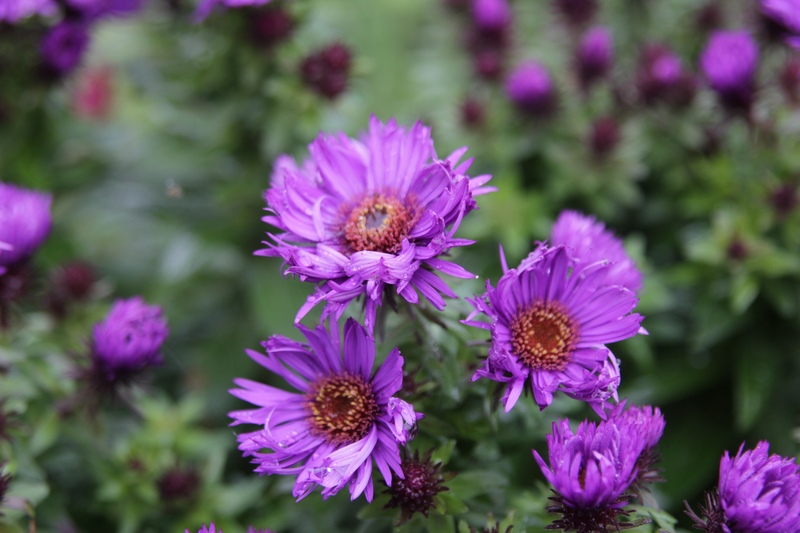 What “normal” gardeners will be aware that what used to be listed as “Aster” could now be Aster still or Almutaster, Canadanthus, Doellingeria, Eucephalus, Eurybia, Ionactis, Oligoneuron, Oreostemma, Sericocarpus or Symphyotrichum (your article only lists two of the options)? And I’ve heard rumours that Iris reticulata is going to be something else because it used to be that something else then someone decided it should be lumped in with Iris but the consensus now is that that was wrong so it’s going back to whatever its original name was. Hardly any John there’s so many new confusing names for just one old easy name, why on earth would normal people want to learn all those? Iris is going to be worse, I think there’s 18 new names to learn……. I spend a lot of time looking around garden centres and I still wasn’t aware of some of the changes you mentioned! They may have had something I was looking for and couldn’t find but it may have been under a different name. Can’t really argue with DANA but how ironic that there are now several Latin names in use for certain plants, when the idea of using Latin was to avoid confusion over use of local variations and common names! That’s the frustrating part isn’t Paul, Latin names themselves have come confusing! Goodness, thank you for saying so! Sequoia and Sequoiadendron; one is a redwood and the other is a redwood tree. . . just so you know. Ha! and Douglas fir being a false-false red cedar!